In Amravati ActionAid and Apeksha are working together to improve the lives of the tribal families. Like other families in Kasmar, Shantabai’s is dependent on forest produce which is the major source of livelihood for tribal families living here. Before, they used to collect average 5kg mahua in a day and sell it to the middleman for Rs. 20-40 for 5kg. 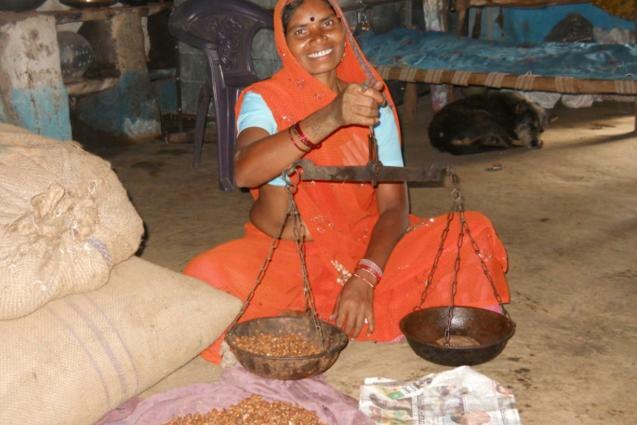 But the middlemen swallowed all the profits by ‘under’ weighing the mahua flowers and quoting less than market rates. Mahua is ready for gathering in winter – the season is short, lasting only one and a half months. The flowers have juicy leaves and strong fragrance. People gather as much as they can and sell it off at whatever price they can get. 25 families are getting benefit from Mahua bank in Kasmar village. Also, from 10 villages, 230 families and 1202 people are beneficiaries of Mahua bank.